S.S. Milk Cans available in 5, 10, 20, 40 & 50 litre capacity. Material used AISI 304 & 202 Stainless Steel. Tig welding process used to give fine welding quality. All dimensions very close to aluminum milk cans. Best quality finishing & polishing. - Minimum Weight: 6.00 Kg. 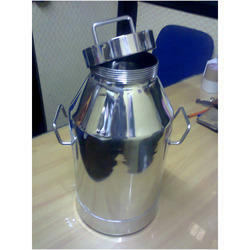 In order to retain our goodwill in this industry, we are providing a latest array of Stainless Steel Milk Canister. We have been counted amongst the most trusted names in this domain, engaged in offering a standard quality range of Steel Milk Container. WE SUPPLY STAINLESS STEEL MILK CANS OF ANY SIZE. 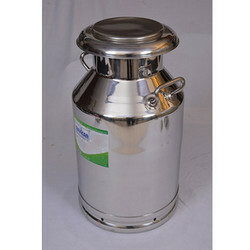 As an important entity of this domain, we provide the handpicked quality of SS Milk Container. Known for their elegant design and impeccable finish, these SS milk containers are manufactured by using modern machinery. Worldwide shipping Other sizes available.